The King of Portugal Manuel I the Fortunate would never know his decisive and incredible outcome, because he would die before he knew about it. When that expert marine-soldier of the Portuguese nobility, a certain Fernando de Magallanes (Fernao de Magalhaes, Ferdinand Magellan), proposed to set up a flotilla in order to discover a route to the west to reach the strategic “islas de las especierias”, he and his advisors considered it risky and unfeasible. They already had their route to the east by the Cape of Good Hope and Portugal was by then -together with Spain- the first colonial maritime power in Europe. An offended Magallanes would then go on to propose his strategic adventure to the all-powerful Carlos I, King of Spain and future Emperor of the Holy Roman Empire (as Carlos V). In Seville (1518), then the economic capital of the world (by centralizing trade with the Western Indies through the Casa de la Contratacion), the Caesar Carlos will accept his intrepid journey through Castilian seas (according to the Treaty of Tordesillas, which in 1494 divided the world from an imaginary line on the Atlantic Ocean, between the European powers of Spain and Portugal), naming him also knight of the prestigious Order of Santiago, captain of the flotilla and Admiral of the Spices Islands. The squadron, composed of five ships (Trinidad, San Antonio, Concepcion, Victoria, Santiago) and 234 men of the sea, will depart from the Sevillian metropolis the following year (1519), in pursuit of a new route to the Eastern Indies, as that later would become one of the greatest adventures of all time: the western passage towards the Moluccas. After a hard Atlantic journey -for latitudes hitherto unknown to Europeans- and having overcome endless calamities (extreme hunger and thirst, scurvy, Antarctic cold, etc.) and even a mutiny, the loss of one vessel and the desertion of another and its crew, between October 30 and November 1, 1520, three vessels captained by Magallanes doubled by the entrance of the strait that bears his name, crossing the then known as the Southern Sea through the labyrinthine Strait of All Saints (baptized then so given the date). The route would be so dangerous that, in comparison, the new waters would be baptized as the Pacific Ocean (which had already been discovered in Panama by the Spaniard Vasco Nuñez de Balboa, in 1513), a name that has survived to the present day to the detriment of its name original. Those experienced and courageous men would see unprecedented phenomena -when not overwhelming- for the time, such as the fire of San Telmo (considered a good omen as a divine sign), sources of natural gas in flames shining in the dark (lit by indigenous people) in a territory they would call Tierra de los Fuegos / Cabo de los Hornos, or giant humans of great strength, such as Antonio Pigafetta (geographer and Venetian chronicler of the expedition) would describe the Patagonian indians (from the Spanish patones, “big foot”), whose males measured over 6.5 ft (2.0 m), compared to 5.0 ft (1.5 m) of the European standard of the time. After the feat, the expedition will finally arrive in the Philippines (archipelago baptized like that in honor of the Spanish prince, the future Felipe II), where Magallanes will die at the hands of the indigenous (Mactan Island, 1521). Explored the area and established a series of commercial contacts after several armed confrontations, the expedition -now commanded by the Spaniard Juan Sebastian Elcano and integrated by a handful of survivors (18)- crossed the Indian Ocean and circled Africa. A unique boat loaded with valuable spices will arrive to Seville: it was the nao Victoria, of significant name. In subsequent decades, Spaniards will continue to explore and expand their domains not only in the Americas, but in Europe, Africa, Asia and even in distant and unknown lands like New Guinea, Australia, Hawaii or Tahiti. 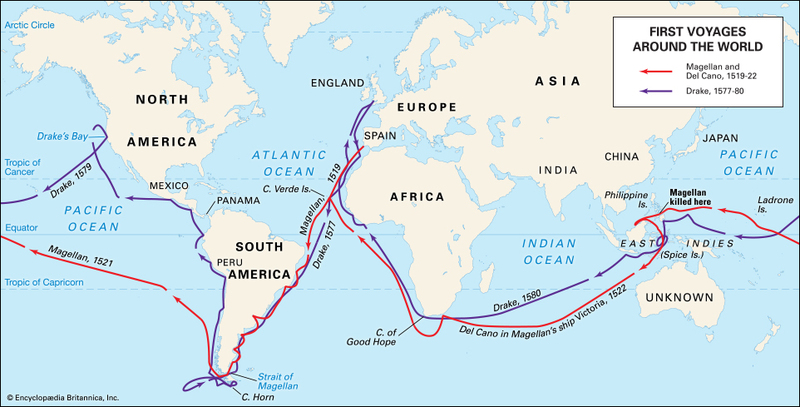 The incredible Magallanes-Elcano expedition ended so that, the first circumnavigation of the planet, ultimately and fundamental milestone for the birth of the first universal empire in history: the Spanish Empire.